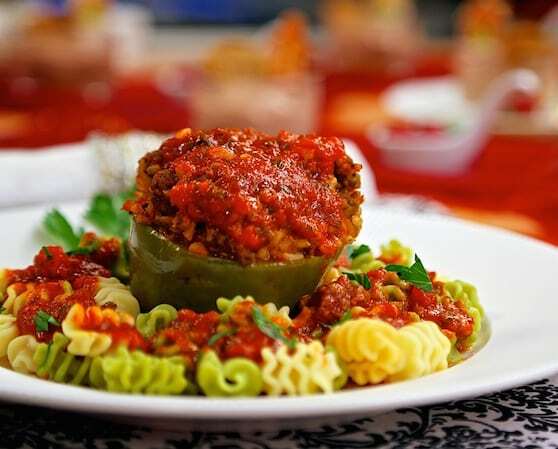 I first made these delicious peppers for a New Year’s Eve party and they were a huge hit! Featuring a meaty-tasting seitan and hearty brown rice stuffing, these beautiful bell peppers satiate omnivores and vegans alike. Ready for the oven in under 20 minutes, these six-ingredient wonders are equally ideal for a holiday party or weeknight supper. Recipe from Vegan-Ease: An Easy Guide to Enjoying a Plant-Based Diet. Published by Jazzy Vegetarian LLC, © 2015, reprinted by permission. Photos by David Kaplan. Featuring a meaty-tasting seitan and hearty brown rice stuffing, these beautiful bell peppers satiate omnivores and vegans alike. Slice about one inch off the top of each pepper. Seed the peppers. Spread 1 ½ cups of the marinara sauce and the 2 teaspoons of olive oil (optional) evenly over the bottom of a casserole that’s large and deep enough to hold all the peppers snugly so they remain upright during baking. Put the seitan, brown rice and all-purpose seasoning in a large bowl and stir well until combined. Stir in 2⁄3 cup marinara sauce and mix to combine. Spoon one-sixth of the seitan mixture into each pepper, mounding it, if necessary. Spoon 2 heaping teaspoons of the marinara sauce over each pepper. Carefully position the peppers in the casserole so they will remain upright while baking. Serve the peppers with tricolor pasta on the side and topped with some of the sauce that has accumulated at the bottom of the casserole. Put the remaining sauce in a gravy boat or small bowl to pass around at the table. You may use unflavored, ground seitan in place of the Italian flavored variety. If using unflavored seitan, add an additional heaping teaspoon of all-purpose seasoning or Italian seasoning blend to the filling mixture before stuffing the peppers. 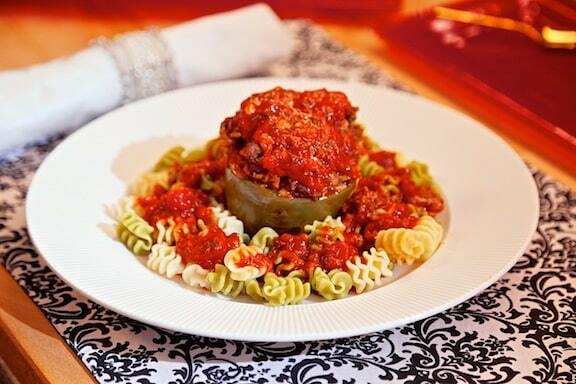 Enjoy plenty of ways to use bell peppers.